On November 13, up to 129 people were killed, 352 injured (of whom 99 in critical conditions) in at least 6 coordinated terrorist attacks in Paris. 7 attackers were killed; all of them were wearing suicide vests. The exact death toll remains unknown as the situation is still unfolding. One more attacker, Abdeslam Salah, is still at large. The Islamic State has claimed responsibility through a video saying that France would not live peacefully as long it continues its bombing campaign in Syria. Belgian security service believe that the mastermind of Paris attacks is Abdelhamid Abaaoud, who left Belgium for Syria in January 2015. 21.25: Terrorists arrive on board of a black Seat Leon and open fire on customers with AK-47 rifles (Kalashnikov) at Le Carillon bar (Rue Alibert 18), and at the “Le Petit Cambodge” restaurant in Rue Alibert 20. About 15 people were reported killed and 10 were in critical conditions. 21:30: Second explosion at the Stade de France. 1 suicide bomber killed. 21:32: Terrorists arriving on board of a black SEAT open fire on customers of the Café Bonne Bière in Rue du Faubourg du Temple 32 and La Cosa Nostra restaurant in Rue de la Fontaine-au-Roi. 5 people were killed and 8 wounded and in critical conditions. 21:36: Terrorists arriving on board of a black SEAT open fire on customers of the La Belle Equipe restaurant in Rue de Charonne 92. 19 people were killed, 9 in critical conditions. 21:40: A suicide bomber detonate his vest inside the restaurant Comptoire Voltaire in Boulevard Voltaire 253, killing himself and seriously injuring a bystander. Others were slightly injured. 21.40: A group of 3 attacker on board of a black Polo enter the Bataclan concert hall in Boulevard Voltaire 50. After regrouping the audience near the orchestra area, they mention the French intervention in Syria and Iraq as the motif for their action. Then, they opened fire on the crowd of about 100 people. At about 00.30am, police stormed the Bataclan shooting dead 1 attacker, while 2 others detonated their suicide vests. 89 people were killed and many other were wounded. 23.50: President François Holland declared State of Emergency and the closure of borders. In addition, he demanded the deployment of 1,500 soldiers in Paris. 3 of the attackers were identified as French national Omar Ismail Mostefai, Egyptian and Syrian nationals. The latter may have entered in France as a refugee, as the passport found next to the body of a suicide bomber in State de France was recorded at the border of the Greek Island of Leros in October. Team 3: 3 suicide bombers attacked the Bataclan cultural center. The group may have dropped the 4th attacker at the Comptoire Voltaire before entering the Bataclan. The Volkswagen Polo used in the attacks at the Bataclan had Belgian plate. Inside, a parking ticket from Brussels’ Molenbeek district was found. Metro lines 3, 5, 8, 9, 11 have been closed in the 10th and 11th districts. Buses have also been halted. 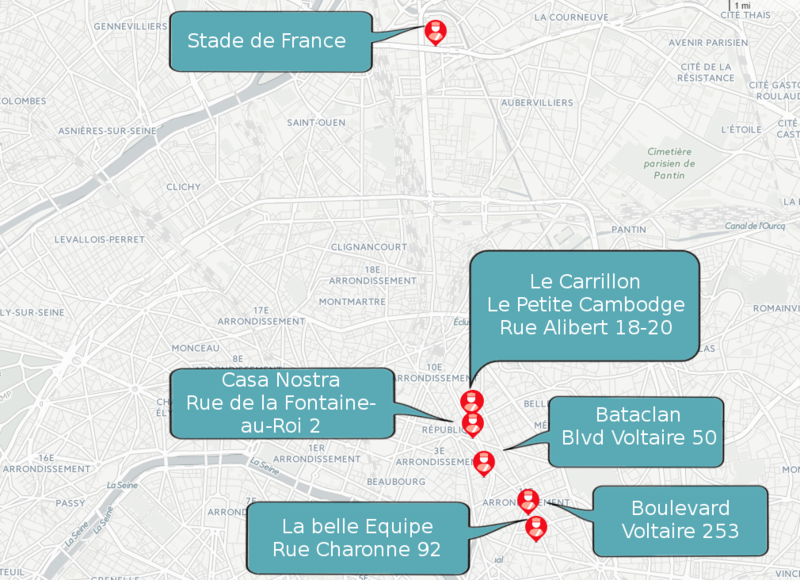 French authorities have declared the Red Plan Alpha, which indicate urgent measures to secure multiple victims in a location. President Holland have declared the State of Emergency, demanded the closure of border and increased security in Paris, where about 1,500 soldiers were reported being deployed.